today’s article is for those Apple users who want to know more about their gadgets and learn to have the most from them. You can learn how to achieve the maximum performance of your mobile devices and share this knowledge with others. I want to tell you how to upgrade software on your iOS devices correctly, without any mistakes. So, your iPad or iPhone will work ideally. Software updates are released nearly every day, so, staying up to date can be a confusing task. You always need to check updates and install them. However, with iOS, things are much more straightforward than with MacOS. Before we start updating our devices, let's define with the main words that will be useful. Software means both the iOS system of an iPhone or iPad and different apps installed on them. Not to frustrate you more, I'll name apps as 'computer software' created for different purposes. People often believe different myths and don't update their devices. Such concerns are false and even can harm your gadget. Let's discuss all such concerns. 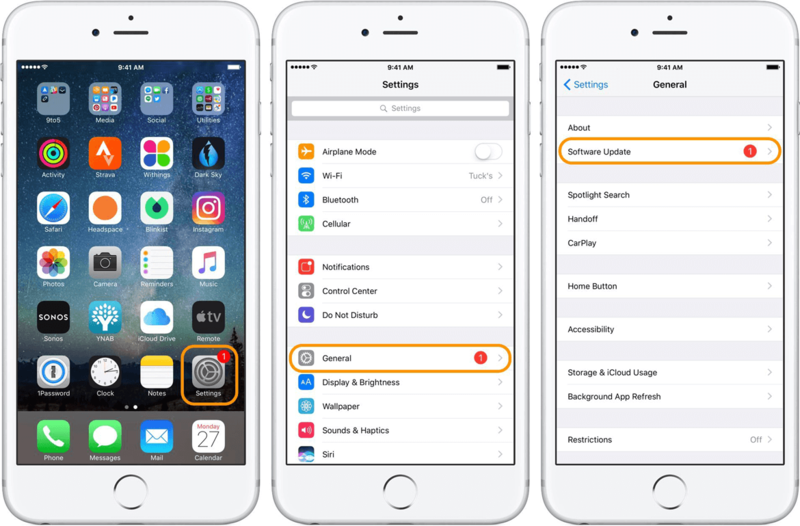 A common thing that users believe is that updating the iOS or specific apps will cause serious problems or small glitches that may affect the overall performance. This thought appears in someone's consciousness after hearing other people's stories about problems they never had before updating. Unfortunately, everything is possible and sometimes issues can happen. However, there are a few things to bear in mind. iOS and applications updates are designed especially for fixing bugs. They also improve security and may include new useful features. You may understand that not installing an update may cause serious issue as well as installing it. So, it's up to you to decide whether to do it or not. There is no guarantees, but you should have a backup in case something goes wrong. I described how to do it in one of my previous articles. Technologies are fragile and even strong Internet systems like Amazon services can fail from time to time. It's natural. I prefer installing updates as soon as they are ready for downloading. Nevertheless, if you like to act cautiously, you could wait for a week or even more to see if other people who have installed an update ran into problems. If everything is okay, try it by yourself too. Don't wait for too long time as you may face troubles with compatibility and security. The longer you wait and don't install updates, the larger issues may arise. As for me, I notice more anxiety and discussions around iOS updates that MacOS ones. I think it can happen so cause we rely on our mobile devices too much and feel frustrated and abandoned when they work in a wrong way or stop functioning at all. People are tied so much to these communication devices that we can't imagine our life without them. If you don't trust updates, keep an eye on the news on the Internet. Usually people tell about issues within the first hours after the official update release. Now I want to look at installing updates both for the system and applications. Read this manual to get knowledge and experience to become a more confident iOS user (or even an expert). The simplest way to update the system on a mobile gadget is to connect to a wireless network and installing it via 'Settings'. But this way is not the only one. You can install it via iTunes. In this case, you'll have to plug in your iPhone or iPad to a Mac or a PC using a Lightning cable or USB cable. Then, launch iTunes, click your device's icon, go to 'Summary' and select 'Check for update'. Connect your mobile device to Wi-Fi. Find and launch the 'Settings' app. Head to 'General' and choose 'Software update'. Click on 'Download and install'. Usually, there is a red badge that shows you another available update, but it is not always visible for some reasons. So, it is better to check updates manually from time to time. After an available update appears in that menu, select 'Learn more' to find out what features are there and what bugs this update will fix. 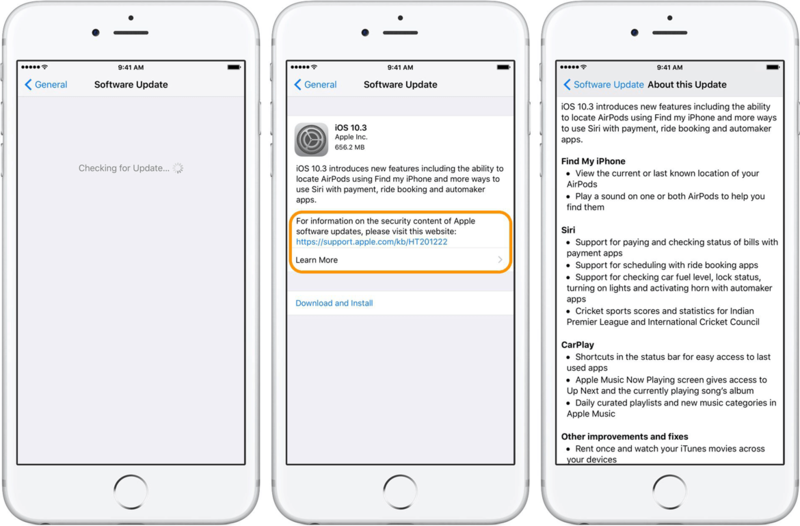 You may tap on the link to Apple's site (it is above the 'Learn more' option to get to a detailed description of this new update. Descriptions usually include the list of security fixes and other useful features. 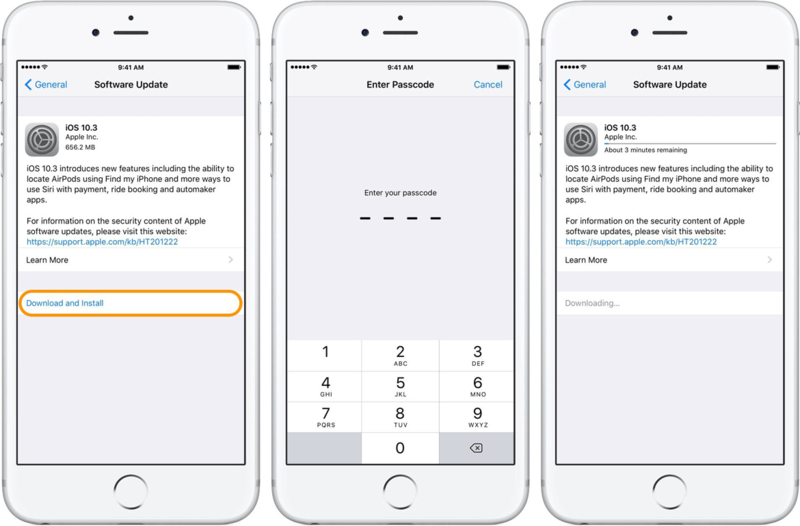 Choose 'Download and install', type your password, and wait until the upgrade downloads to your mobile device. You can choose whether to install the update or to wait a bit after it has downloaded to your device. 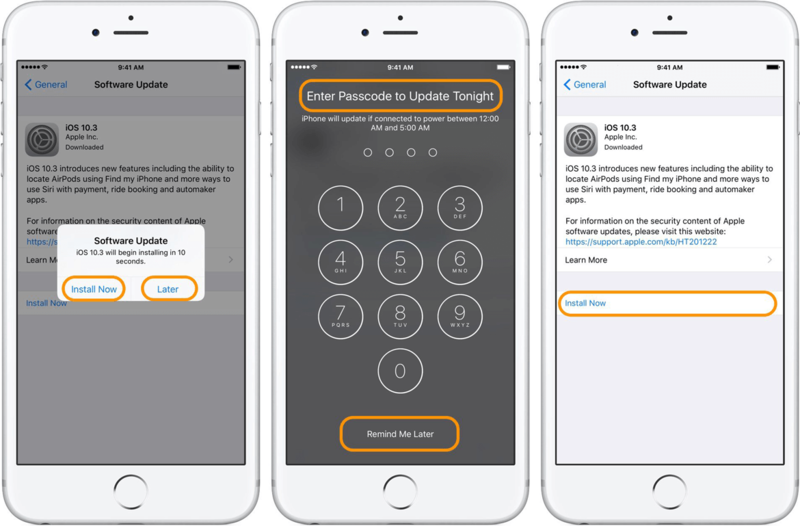 Choose the 'Later' option, if you want to update an iPhone or iPad while sleeping or to get a reminder about this update. Make sure that your device is plugged in, if you choose the 'Update tonight' option. This is a piece of cake! You can even make this process automatic in order not to spend your free time on updating them. This concerns both built-in and third-party apps. You can also keep calm while those applications will be updating, as App Store approves only normal software that won't harm your device. 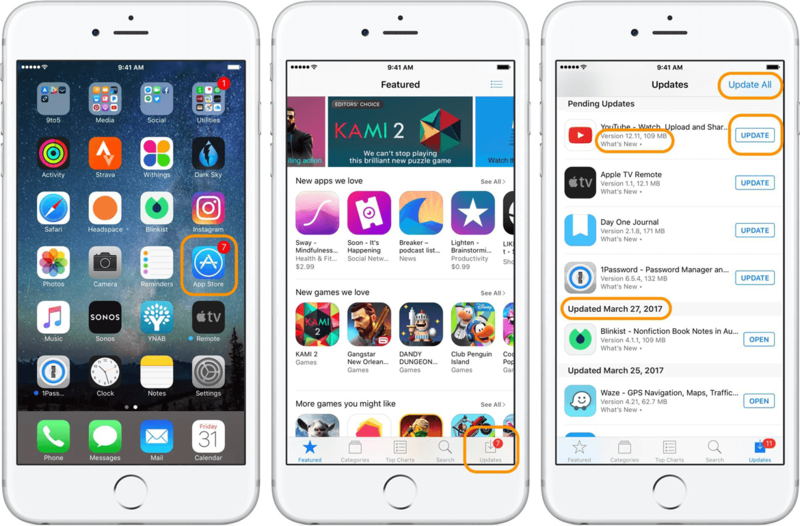 At the same time, you can upload and install apps without App Store, but you should understand that you take a risk when doing so. I don't recommend working with apps you are not confident in. They can include viruses or simply be bugged. It is always better to use the official App Store for getting new apps and updating them. Select 'Updates' in the lower right corner. You can 'Update all' in the upper right corner or update just the selected apps individually. In addition to that, you may go to the 'What's new' section. Find this line at the right side to the app icon to learn more details about every update. So, you'll know about what features you will get. Below the 'Pending updates' line you will see the list of already updates applications. Find and select 'iTunes & App Store'. Move the toggle near the 'Updates' line. It should become green. This won't affect your iOS, but will work only with applications. There is also an option for automatic updating Music, Books & audiobooks sections across all your Apple mobile devices. Was this article helpful? Subscribe to learn more!